Is incorporated by Tamar River Cruises and has been family owned and located at Launceston's Home Point since 1996. 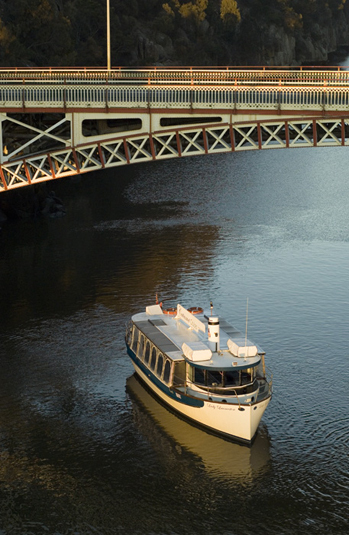 The Lady Launceston has shared the unique cruising experience of the Launceston's waterfront and the majestic Cataract Gorge with thousands of guests and there truly is no better way to experience one of Tasmania's most popular attractions. Our cruises depart hourly from our Home Point cruise terminal only a short walk or taxi from Launceston's CBD. We take pride in maintaining the Lady Launceston to immaculate standards and selecting experienced, professional and friendly crew. Our catering options for private functions incorporate renowned Tasmanian fresh produce and our wine selection showcases some of the Tamar Valleys best. We hope you too will have the opportunity to come cruising with us.